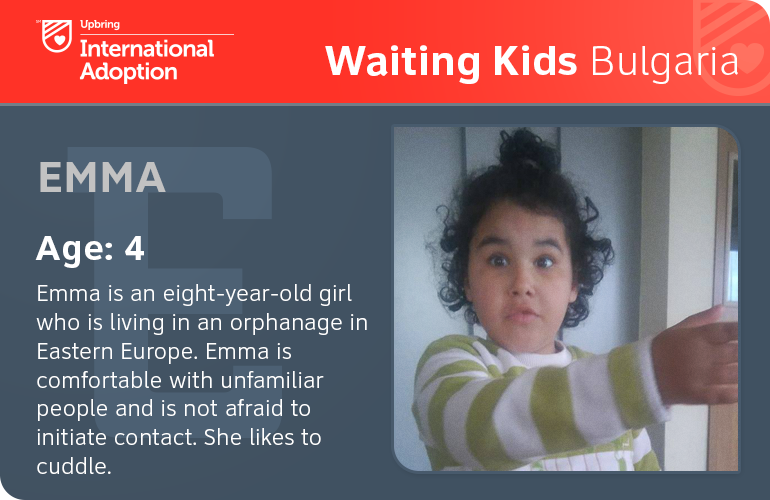 Emma is an eight-year-old girl who is living in an orphanage in Eastern Europe. She has been diagnosed with epilepsy and strabismus. Emma is comfortable with unfamiliar people and is not afraid to initiate contact. She likes to cuddle. Emma can vocalize combinations of syllables and pronounce a few words. Her caretakers report that the sounds she expresses vary depending on her state, needs and desires. Eventually, one can understand what Emma is trying to communicate. She is currently receiving care for children with special needs. Emma enjoys familiar and repetitive activities. She is well accepted among her peers and gets along well with other children.